Colorado Springs, CO, April 25, 2016 – RE/MAX Properties, Inc., one of the most successful real estate companies in Colorado Springs, ranks among the 50 most productive brokerages in the U.S., based on home sales data in the prestigious 2016 REAL Trends 500 survey. RE/MAX Properties, Inc. placed 24 out of 50 (or, ranked in the top 50) with an average 22.8 transaction sides per agent. When measured by the number of transaction sides per agent, RE/MAX Properties, Inc. was also one of only 3 Colorado Springs, CO real estate brokerages included among the top 50 brokerages. The 2016 REAL Trends 500 survey ranked the largest U.S. brokerages by total 2015 residential transaction sides, with each required to have a minimum of 500 transactions sides last year to qualify. Based on the survey’s top 500 participating brokerages, RE/MAX calculated the highest-ranking 50 who averaged the most transaction sides per agent. 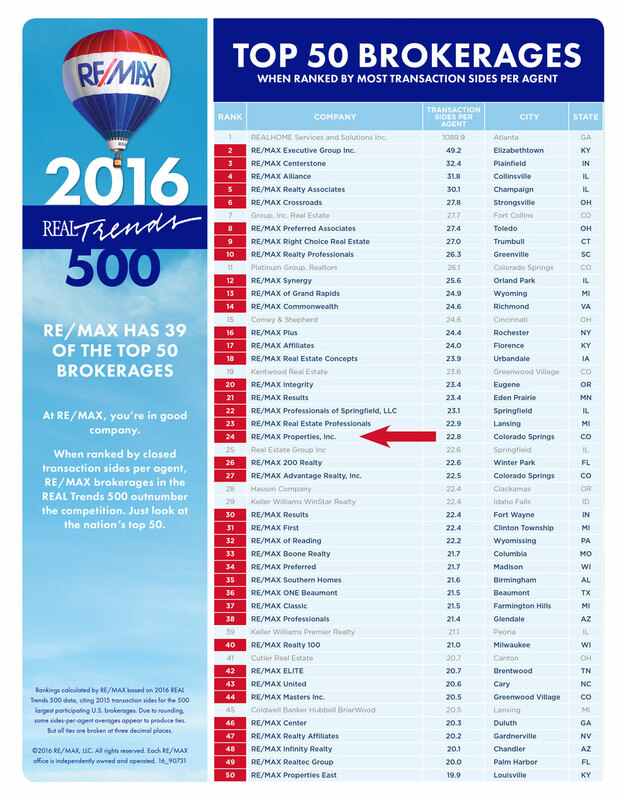 Of those top 50 brokerages, an impressive 39 were affiliated with RE/MAX. RE/MAX supports its franchisees with an extensive collection of technology, tools and training resources, like the award-winning RE/MAX University, RE/MAX Leadstreet® lead generator and CRM, RE/MAX Design Center for professional marketing materials and a worldwide referral network. RE/MAX is in nearly 100 countries, more than any of its competitors.